Normally, if you let produce sit around for awhile, bad things happen. Soft spots. Wilt. Mold. Eyes sprouting. Ooze. Fruit flies. Rot. Okay, I’ll stop with the grossness. But sometimes, if you let produce sit around, good things happen. Like what? Like ripeness, for one. This time of year, you just never really know what’s gonna happen in the garden. And I speak specifically of the summer hangers on—the zucchini and yellow squash, the basil, the peppers, the tomatoes. Especially the tomatoes. Less sun, cooler weather means they take a way long time to ripen on the vine. And the frustrating part is a tomato could be green and happy one day, and then the next day it could be on the ground, fodder for the ants. So, I pick them up and bring them home. Or I pick them when they’re just turning orangy. Or I pick one or two whenever I visit the garden, which is about twice a week this time of year. 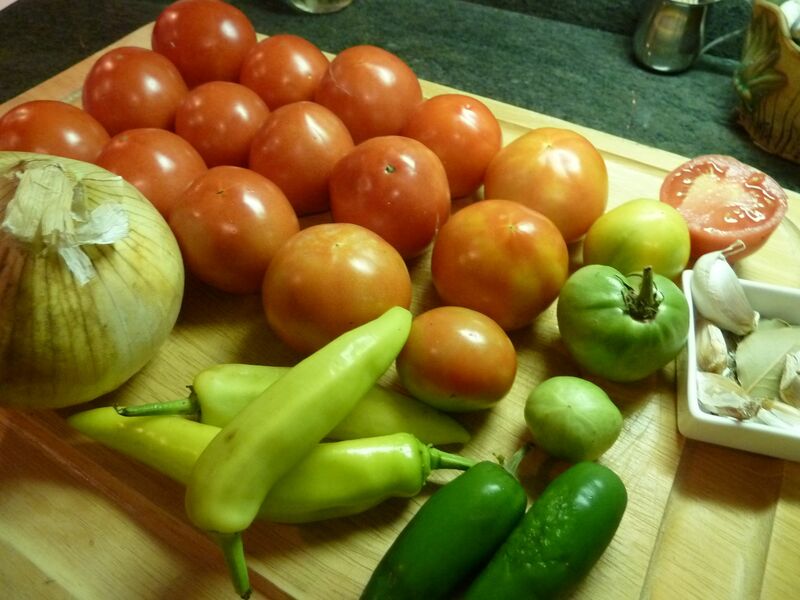 What to do with green tomatoes? Orangy tomatoes? Let them sit on the counter—they’ll ripen. Kinda. Not a nice and juicy vine-ripening experience, but they’ll turn red. Ish. 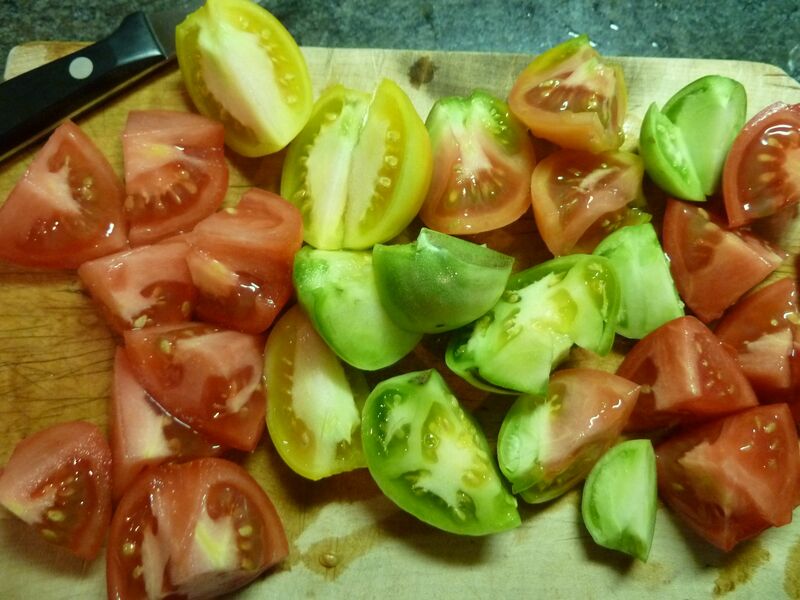 Look at that tomato in the middle—it's like the Italian flag. With a mix of tomatoes in all stages of ripeness, I turn to a recipe from Emeril Lagasse I pulled off the Food Network website. The original calls for pancetta and three different types of hot peppers – jalapeno peppers and Anaheim and pasilla chiles. 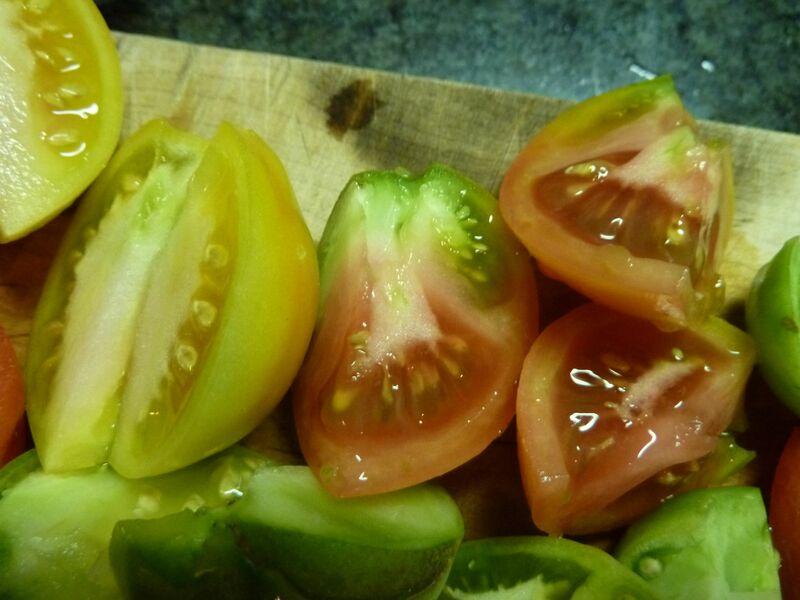 And, it calls for just green tomatoes. Is it spicy? Oh yeah, it’s spicy. Feel free to add a dollop of sour cream to cool it down. Me? I like to add a spoonful of pesto. Tomatoes and basil – a perfect match. -Heat oil in a pan over medium heat. Saute onion until just translucent – 4-5 minutes. Season with salt and pepper. -Add garlic, bay leaves, garlic, and peppers and cook for 4-5 minutes. Add tomatoes and stock, then adjust seasonings with salt and pepper to taste. Bring soup to a boil, then turn down heat and simmer for 15 minutes or so, until the tomatoes are soft. -Time to puree!! But remove the bay leaves first!! You can puree in batches in a blender. Or, we have an immersion blender that does a terrific job. Sure, you’ll get a bunch of tomato skins getting kinda caught in the blendery parts. Just remove, or put back into the soup—whatever your preference. If you’ve pureed in batches in a blender, pour the soup into a separate bowl. -Add the lemon juice. Give it a taste. Spicy? That’s what it’s supposed to be. Try with a bit of sour cream. Or shaved parm. Or the runny part of your stash of pesto. Be sure you have some crusty bread. You’re gonna want to sop up that goodness. 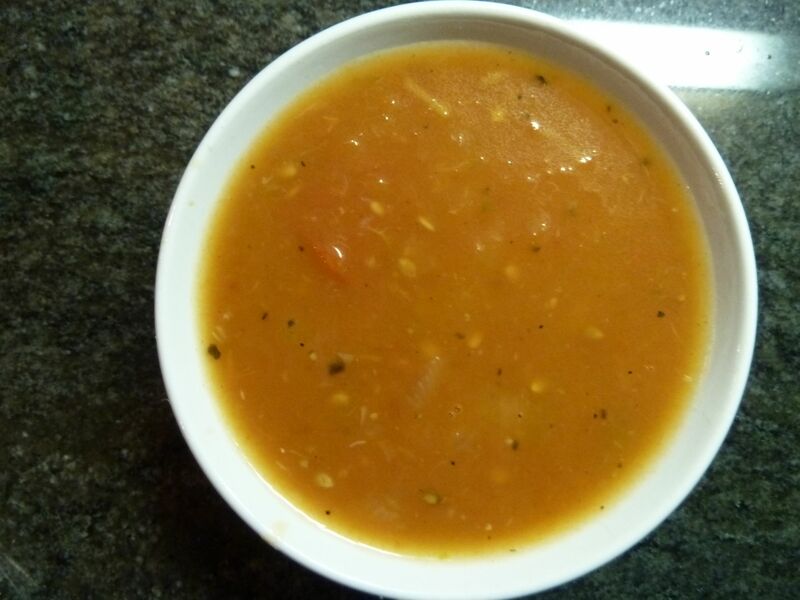 You know, this would be a great soup to make for the Homegrown Food Challenge. Luke, give this a try—I know you love spicy stuff! You are currently reading Spicy Tomato Soup at The Dainty Dot.